The G. Robert Vincent Voice Library is a collection of over 100,000 hours of spoken word recordings, dating back to 1888. The collection includes the voices of over 500,000 persons from all walks of life. Political and cultural leaders and minor players in the human drama are captured and cataloged to serve the research needs of a local, national and international user base. Clients include students and faculty of Michigan State University, other scholars and researchers, broadcasting networks, news agencies and film, video, and Web production companies. Online access to Voice Library holdings is determined by copyright law. Items held in the public domain and those with permission granted are available for listening as mp3 files. See a listing of recordings available for online listening. Look for "Listen to sound recording". Copies of many other items may be borrowed through Interlibrary Loan, via a public or university library. Some fees may apply. All recordings may be listened to at Vincent Voice Library facilities on Four West of the MSU Main Library in East Lansing. Please check our hours of operation. 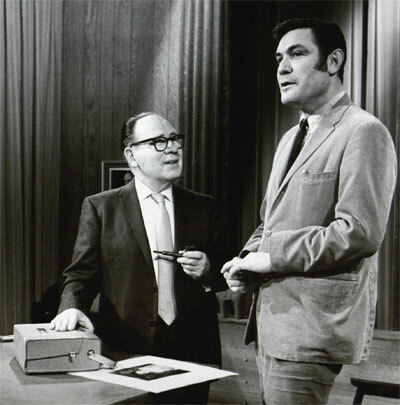 G. Robert Vincent (left) chats with Dr. Maurice A. Crane in the studios of WKAR Television on the campus of Michigan State University. Circa 1966.